Artwork Panel: 28.2cm x 44cm ≈ 11" x 17¼"
Silk/Brocade: 37.1cm x 106.5cm ≈ 14½" x 42"
This Japanese woodblock print reproduction features a woman getting ready to do a bit of sewing on a light blue patterned piece of cloth. Her cat relaxes nearby on the floor with some of her tools. 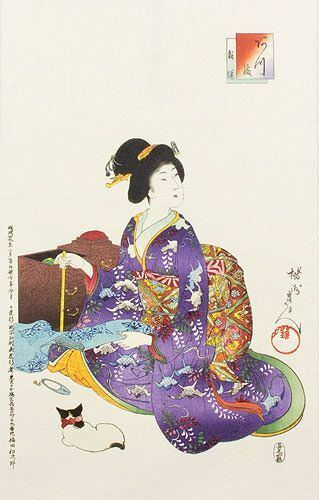 The original artist is Yōshū Chikanobu (楊洲周延). However, his birth name was Hashimoto Naoyoshi. When he was younger he studied the Kanō school of painting, but later switched to ukiyo-e and studied with a disciple of Keisai Eizen. Later he joined the school of Ichiyūsai Kuniyoshi and took the art name Yoshitsuru. After Kuniyoshi’s death, he studied with Kunisada. Later he studied nigao-e with Toyohara Kunichika, and took the art name Isshunsai Chikanobu. He was not just an artist. He was also a retainer of the Sakakibara family of Takata domain in Echigo province. After the collapse of the Tokugawa Shogunate, he joined the Shōgitai and fought in the Battle of Ueno. Thereafter he fled to Hakodate, fought in the Battle of the Goryōkaku under the leadership of Enomoto Takeaki and Ōshima Keisuke, and achieved fame for his bravery. Later, he became an artist/illustrator for the Kaishin Shinbun (newspaper) and also produced many nishiki-e prints. When he died, he had no disciple or apprentice. Upon his death in 1912, the Miyako Shinbun (Capital City Newspaper in Tokyo) reported that the fact he died without an artistic heir to carry on his tradition was, "most regrettable." Original artist: Yōshū Chikanobu 楊洲周延 (1838-1912). This artist at other times used the art names, Ikkakusai (一鶴斎), Hashimoto Chikanobu (橋本周延) and Toyohara Chikanobu(豊原周延) and others as mentioned above. The original woodblock was created in Japan, July of 1896.